Another iconic piece from Goldfinger also first appears in Woman of Straw: the white dinner jacket. 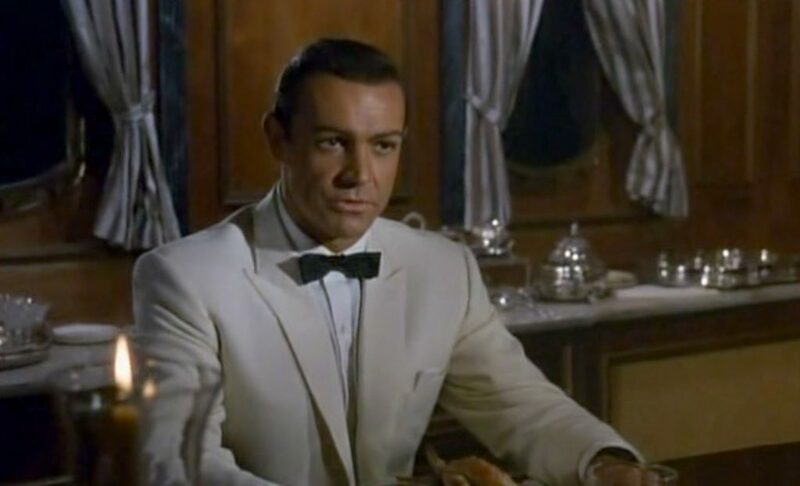 The ivory (the true colour) dinner jacket sees a little more use in this film than it does in Goldfinger, and Sean Connery wears it on two occasions in the Mediterranean, for a dinner at sea and for a fancy party. In warm weather, everything is a bit less formal, and this less formal variant of black tie is most appropriate. 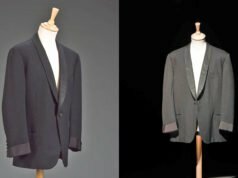 This ivory wool dinner jacket has a one-button front with self-faced peak lapels, four-button cuffs, jetted pockets and no vents in the rear, following the proper black tie tradition. The black trousers have double forward pleats and no stripe down the side. The shirt is different than what Connery wore in Goldfinger. It’s plain white poplin with a spread collar, double cuffs and a placket, no pleats or satin stripes like the shirt in Goldfinger. The placket has stitching is closesly spaced down the middle that suggests regular Bond-film shirtmaker Frank Foster made this shirt. The bow tie is black satin silk in a narrow batwing shape, just like what he wears as James Bond. 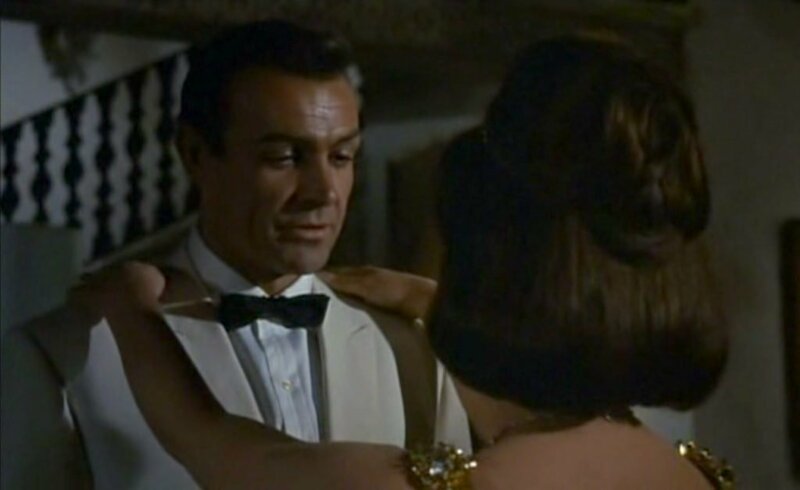 Connery foregoes the bouttonnière but wears a folded white linen handkerchief in his breast pocket. The sliver of white handkerchief in the breast pocket gets lost against the ivory dinner jacket, and a darker handkerchief—such as one in red like the Goldfinger carnation or with a black polka dot—would have been a better choice. I’m glad to see that the beautiful clothes were not wasted. The same tweed hacking jacket has been in three films! Have you considered Hitchcock’s Marnie as a source? Connery looks his very best there, with a fantastic wardrobe, especially when in the country. It was filmed around the same time as Goldfinger and his clothing is Bond worthy. Also, can I make some fan requests for future posts? Looks like I’m going to have to watch this movie, I see that it’s available from Netflix, I’ll have to check it out. Big fan of the wardrobe in Goldfinger, and I think you’re right, the similarities here are too great to be a coincidence. 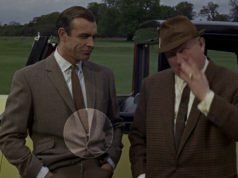 It seems the jackets in this film have no buttonholes on the lapel though they do in Goldfinger. But it may come from the definition on the pics you posted for the hacking jacket. One will have been cut and sewn for the carnation for Goldfinger which may explain why the buttonhole looks dreadful in the teaser sequence when Bond puts the carnation…I checked the film and it is more of a butcher’s job than a tailor’s! BTW Imdb claims the dinner jacket is the same and has the initials of the Woman of Straw character AR sewn in. What source? Was the jacket auctionned or on a catalogue of some sort? Anyway I am glad Sir Sean did not recycle his Zardoz suit in Never Say Never Again!!!! I was looking for the buttonhole in Woman of Straw, but it really is difficult to tell with the low-resolution of my copy of the film. It may have been added just for Goldfinger. I am not aware that this dinner jacket has ever been auctioned, but at no point in Goldfinger could I make out “AR” written inside the jacket. I do not know the source of that information. It’s also likely that the AR could have been an AS for Anthony Sinclair, and I find it strange that the inside of a jacket would be monogrammed for a film. Looking again at the pictures you posted for the Fort Knox fight, the shirt placket seems to be “Foster style”. Another bit of recycling and an explanation on the cocktail cuff exception of Goldfinger ? or just my poor sight 😉 ? As for the AR monogram in Woman of Straw, the dressing gown I saw on some stills has one, that would be “in character” for the dinner suit. I have to see that film! Yes, there is a black notch-lapel dinner suit, the same one used in Goldfinger. Thanks for these last two posts. Like Kyle, I am too a big fan of the Goldfinger wardrobe. This film, along with the above-mentioned Marnie, show Connery at his absolute physical peak in 1963-1965. On a somewhat different note, I recently saw clips on youtube from Connery’s receipt of the AFI lifetime achievement award. It is interesting to see the actors without the support of the Bond production team. Connery’s tuxedo looked appallingly tailored, with pants that appeared way too long. Similarly, Pierce Brosnan’s tuxedo was well-tailored and appallingly, fashionably all-black. By contrast, and I guess to channel David Marlborough a bit, Roger Moore looked positively Bondian 25 years before at the academy awards presenting Cubby Broccoli with his Irvin Thalberg award. At your discretion of course, it may make for interesting posts in the future. While your on a roll with “Other Movies” theme, Matt, would you consider the Hayward tailored light/mid grey 3 piece Moore wears in the awful 1990 movie “Bullseye”? As I say, awful movie but naturally with Moore/Hayward some beautiful clothing. 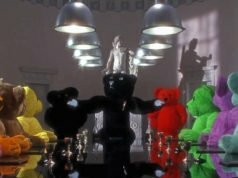 After watching this I noticed that the wardrobe isn’t the only thing recycled in the Bond series. The actor who plays the detective is Alexander Knox, who would later play the President of the United States in You Only Live Twice. I was impressed with Connery’s performance. Clothes aside, quite a departure from James Bond! What’s the point of wearing a white hanky if the jacket is that light coloured?